The 1985 Local Elections saw a Labour Party – which was part of a coalition government with Fine Gael – fare poorly, with its national share of the vote dropping to just over seven percent and with its position as the leading left wing party being usurped by a major contender for this position, namely the Workers Party. The 2014 Local Elections saw a Labour Party – which was part of a coalition government with Fine Gael – fare poorly, with its national share of the vote dropping to just over seven percent and with its position as the leading left wing party being usurped by a major contender for this position, namely Sinn Fein. Labour won 121,900 first preference votes at the 2014 Local Elections. This was down by well over one hundred and fifty thousand votes on the number won by the party (276,627) at the 2009 contests. 33,782 of these votes were won by female candidates (27.7% of the Labour Party total) and the remaining 88,188 votes (72.3%) won by male Labour Party candidates. (The party’s share of the vote in the 110 constituencies that they did contest was 8.7%.) This overall number of votes amounted to 7.2% of the votes cast nationally at these elections. This share of the vote was down on the 14.7% vote share won by the party at the 2009 Local Elections. The number of seats won by Labour fell from 132 in 2009 (14.9% of the total number of City/Council seats at that election) to 51 in 2014 (5.4% of the seats). Labour did not contest roughly twenty percent of the constituencies at these local elections. Regionally, the party still fared best in the Dublin region at the local elections, where Labour candidates won 12.0% of all the first preference votes, but the party vote share in Dublin fell dramatically from a 26.4% level at the 2009 elections. The party vote share at the local elections was notably higher than the 7.4% vote share won by their Dublin candidate, Emer Costello, at the European elections, as shown by Figure 2. Despite a stronger result in Dublin than in the rest of the state, Labour were still significantly out-polled by Sinn Fein in this region while the party also won a smaller share of the vote at the European contest than that won by the Green Party (and also the Socialist Party). While the party had fared especially well in the more working class parts of the city at the 2009 Local and European elections and the 2011 General Election, Labour actually fared (slightly) better in the more middle class Dublin constituencies at the 2014 Local Elections than they did in the more working class electoral areas. Sinn Fein won nearly three times as many votes as Labour did in these more working class Dublin constituencies at the 2014 contest. 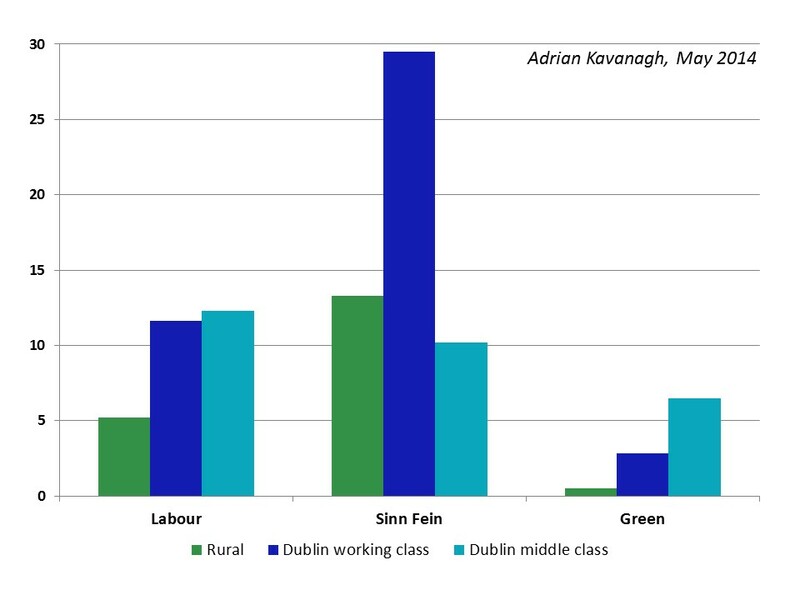 although Labour won more votes than Sinn Fein in the more middle class electoral areas (Figure 3). These elections, however, saw the re-emergence of the Green Party as significant challengers against Labour for the left-of-centre middle class vote. While Labour fared better in Dublin relative to the rest of the state at these elections, the party’s highest shares of the vote at a local authority area level were recorded in Westmeath (13.7%), Kildare (13.5%) and Carlow (13.2%), but just ahead of Dun Laoghaire-Rathdown (13.1%) and Dublin City (12.7%). 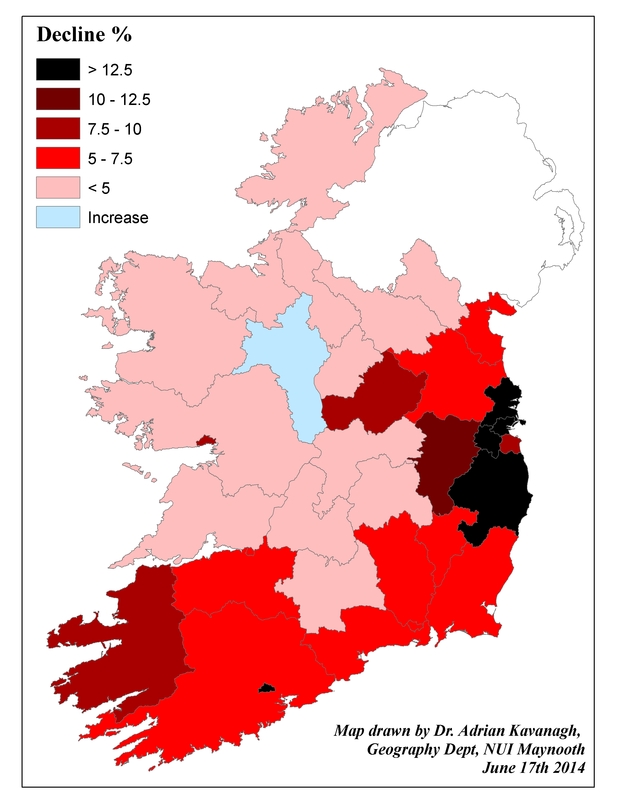 Apart from these counties/cities, Labour failed to win more than one vote in every eight cast in all of the other local authority areas, although the party did succeed in winning more than ten percent of all the votes cast in some other local authority areas, namely Fingal (11.3%), Kilkenny (11.2%), Galway City (10.8%) and South Dublin County (10.2%). Labour did not contest any electoral areas in either Leitrim or Longford. Outside these two counties, the party’s lowest vote shares at a county level were associated with Cavan (0.6%), Monaghan (0.9%), Mayo (1.0%), Offaly (1.8%) and Roscommon (1.9%). While none of these counties would form part of the Labour Party’s main strongholds in terms of party support levels, the party would have entertained hopes of gains in some of these areas at the 2011 General Election. The party also had a relatively strong degree of support in Offaly, but in particular the Tullamore area, during the 1990s, during which time Pat Gallagher held a Dail seat for the party in the Laois-Offaly constituency. 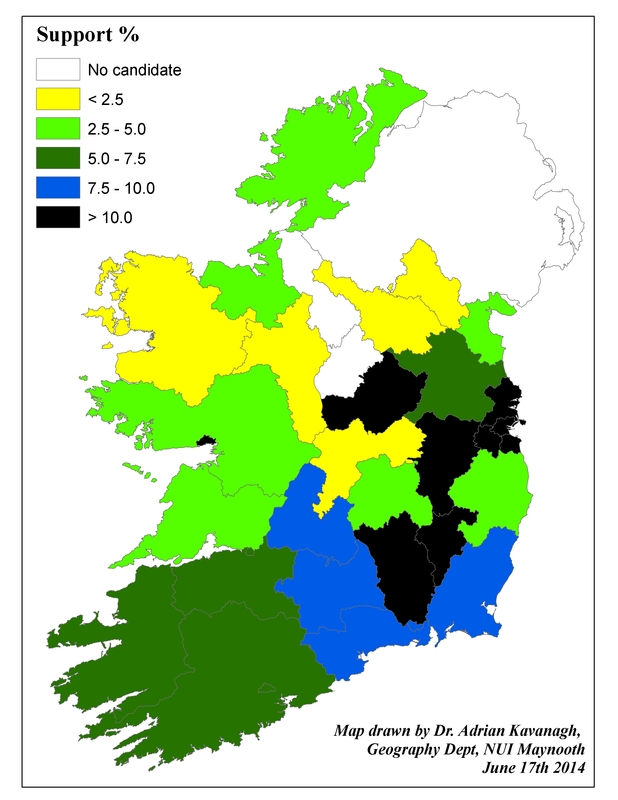 Overall, as shown by Figure 1, the party’s geography of support in these elections reflects the general tendency in terms of Labour support since the foundation of the state, namely that it is especially concentrated to the south and east of a line drawn between Dundalk and Limerick. The areas where the most significant Labour losses occurred generally tended to be the areas where the most significant Sinn Fein gains occurred. Labour’s share of the vote in the Dublin region fell by 14.4% between the local elections of 2009 and 2014. The level of the decline in party support in the other regions – Leinster (7.2%), Munster (6.3%) and Connacht-Ulster (2.1%) – was not as dramatic, but Labour was starting from a lower base (in terms of 2009 support levels) in these regions relative to Dublin. At the local authority level, the greatest decline in party support levels between 2009 and 2014 came in Dublin City (16.7%). The degree of the decline in Labour support level in Wicklow (16.1%) was similarly dramatic, although the changing party support levels in this county reflected the impact of a number of high profile defections involving a number of Labour County and Town Councillors in that county in the year leading up to the local election contests. Labour support fell by over ten percent between the local elections of 2009 and 2014 in a number of other local authority areas, including South Dublin County (14.8%), Fingal (14.4%), Cork City (12.6%) and Kildare (10.2%). The best result at the constituency, or electoral area, level for Labour in the 2014 Local Elections came in Athy, where Labour won 27.0% of the first preference votes and took two of the six seats in that electoral area. (Killiney-Shankill was the only other six-seat electoral area where Labour won two seats despite taking just 18.6% of the vote there, helped by good vote management between their two candidates and some degree of luck with the vote transfers). The party managed to win two seats in a few other electoral areas, including Drogheda, Tralee, Glencullen-Sandyford and Ballymun. Along with Athy, Labour succeeded in winning over twenty percent of the vote in only a small number of electoral areas, including Glencullen-Sandyford (24.9%), Rathgar-Rathmines (21.8%), Mullingar-Kilbeggan (21.2%), Mullingar-Coole (20.4%) and Fermoy (20.0%). There were some very good individual performances by Labour candidates in these elections, it must be noted. Lettie McCarthy topped the poll in Glencullen-Sandyford and was able to bring in a running mate, while a strong personal vote for Maurice Shortall saw him top the poll in Castlecomer (Kilkenny). The party gained two seats in these elections – one in the aforementioned case of Glencullen-Sandyfordand the other in Portlaoise, where Noel Tuohy won the first Labour Council seat in that electoral area in well over a generation. Noel McCarthy topped the poll in Fermoy with an impressive 3,511 first preference votes. Younger candidates such as Jane Horgan-Jones (Clontarf), Rebecca Moynihan (Crumlin-Kimmage) and Grace Tallon (Dundrum) also did well to hold seats in very competitive electoral areas. 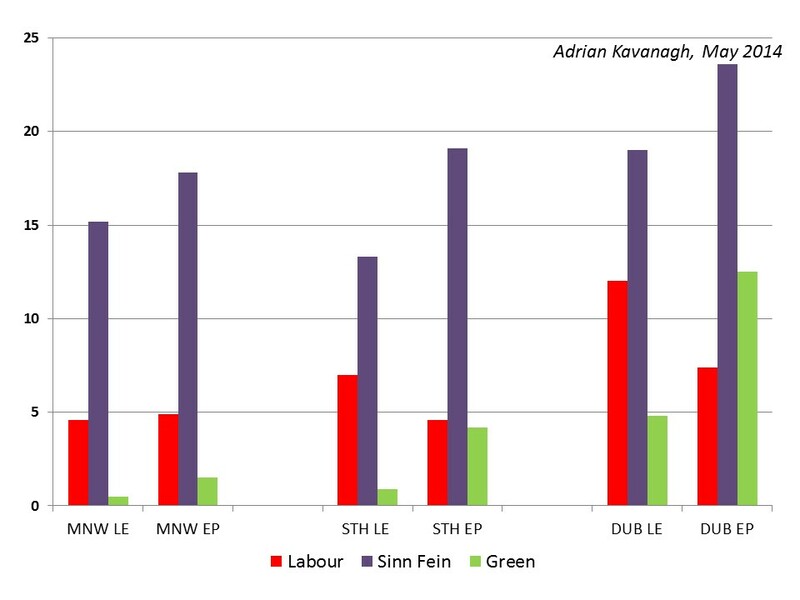 The party’s lowest vote share at these elections was in Ardee, where Labour won just 1.2% of the vote. Labour also fared poorly in Ratoath (1.9%), Cavan-Belturbet (2.1%), Stranorlar (2.1%), Greystones (2.2%), East Cork (2.2%), Clonmel (2.3%), Athlone (Westmeath) (2.4%), Carrickmacross-Castleblaney (2.4%), West Cork (2.7%), Edenderry (2.8%), Ballincollig-Carrigaline (2.8%), Kildare-Newbridge (2.9%), Tullamore (2.9%), New Ross (2.9%) and Killaloe (2.9%) electoral areas. While electoral areas such as Cavan-Belturbet and Carrickmacross-Castleblaney would be located well outside Labour’s main support heartland, more worrying will be the fact that some of these results came in constituencies that the party won seats in at the 2099 contest (although boundary changes does complicate the matter somewhat). In all, the May 23rd contests proved to be a disappointing and ultimately dismal series of contests for the Labour Party, although the writing did seem to be on the wall for some time based on a series of low opinion poll ratings over the past few years. That said, there were some good individual performances by Labour Party candidates which offer some hopes of renewal for the party. But will this Labour Party renewal commence before the next general election or after it? And are these May 23rd election results for the party prefiguring a large number of Labour Party losses at this next general election contest? This entry was posted in by-election, Connacht-Ulster, Dublin, Leinster, Local Elections 2014, Munster and tagged 2009, 2014, Labour Party. Bookmark the permalink.